The John Muir Award is one of the great success stories of the John Muir Trust. The scheme is aimed at helping people from all ages and backgrounds to become involved with wild places and it has proved very popular. In the Cairngorms the Award is carried out via the National Park. 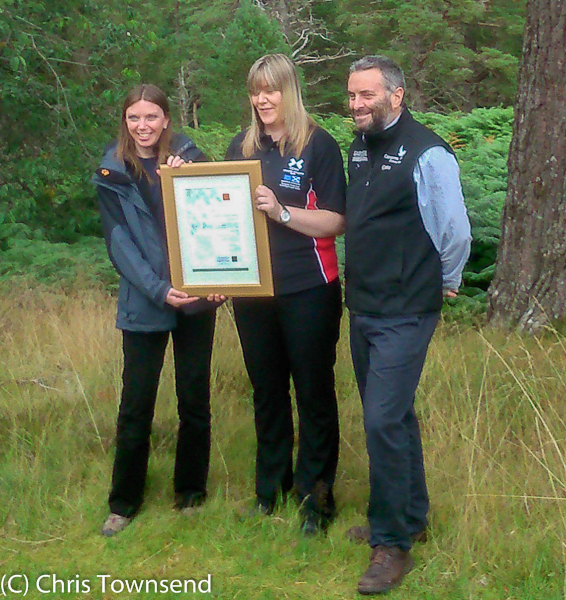 Recently the 25,000th Award in the Cairngorms was achieved by Grace Moir and she was presented with the Award by the Scottish Environment Minister Aileen McLeod at a ceremony at the RSPB's Forest Lodge in the heart of Abernethy Forest. I attended as a representative of the John Muir Trust along with Trust Chairman Peter Pearson. It's always a pleasure to visit the wonderful Forest Lodge, even if finding it in the maze of roads in the forest always seems difficult! After the award ceremony we bumped off down Abernethy's rough tracks in a couple of vehicles to have a look at some of the work the RSPB is doing in the area (I wrote about a longer visit with the RSPB here). We stopped at a high point to look over the regenerating forest to a cloud-shrouded Meall a'Bhuachaille while Jeremy Roberts, Site Manager for the RSPB, pointed out various locations to the Minister. The day was dull and still and the midges emerged in clouds. I was impressed by Aileen McLeod's coolness as she listened to Jeremy and looked at the maps and the landscape. The rest of us were flapping our arms and walking round in circles! Further more formal reports that don't mention the midges can be found on the John Muir Trust website and the Cairngorms National Park website. Great to have you along at this presentation, Chris. Your interest in this aspect of the John Muir Trust's work is much appreciated.